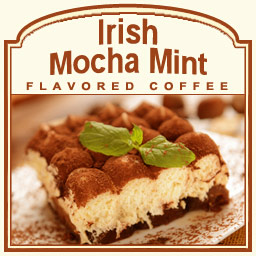 Irish Mocha Mint is one of the most indulgent flavored coffees around with its thick, creamy, chocolaty mocha richness and its cool and refreshing mint flavoring. Smooth and full-bodied, this Irish Mocha Mint also offers an Irish cream undertone that will make your taste buds melt into a blissful, flavor oblivion. Roasted with 100% authentic Arabica coffee beans, this coffee only has 2 calories per cup despite its rich mint and chocolate flavors. Packaged in a heat-sealed valve bag, this Irish Mocha Mint will be roasted and shipped on the same day. Bask in the luxurious flavors of this Irish Mocha Mint flavored coffee and let the swirled mix of mocha and mint mingle on your taste buds � even after the last sip!